The JENEsys® Building Operating System consists of Java-based controller/server products, software applications and tools, which are designed to integrate a variety of devices and protocols into unified, distributed systems controlled in real-time over the Internet using a standard web-browser. JENEsys® products are scalable, increasing the functionality and value of 'smart devices and systems' by connecting real-time operational data to the people and systems that manage business enterprices. JENEsys® products create a common environment that connects to almost any embedded device in the market today. JENEsys® products models the data and behavior of the devices into normalized software components, providing seamless, uniformed view of device data to enterprise via a wide variety of IP-based protocols, XML-based connectivity options, and open API's. By transforming the data from diverse external systems into normalized components, JENEsys® products create an architecture that provides substantial benefits over gateway-based integrations. JENEsys® products are powered by the revolutionary Niagara AX Framework®, the industry’s first software technology designed to integrate diverse systems and devices into a seamless, unified system regardless of manufacturer, or communication protocol. 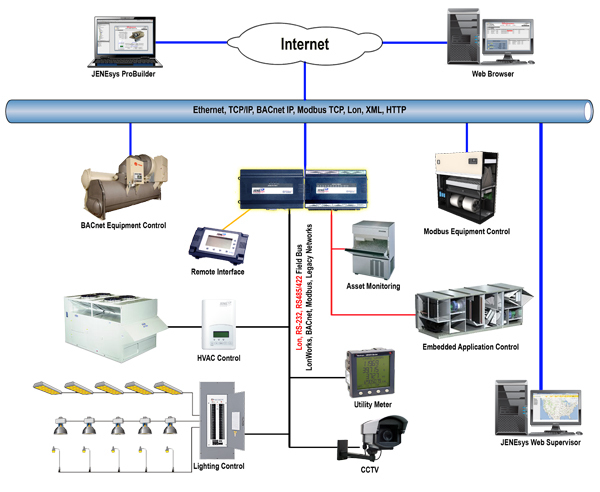 Niagara supports a wide range of protocols including LonWorks™, BACnet™, Modbus, oBIX, Legacy Systems and Internet standards. The Niagara AX Framework® also includes integrated network management tools to support the design, configuration, installation and maintenance of interoperable networks.